Collective dance unit E-girls, comprised mainly of groups Dream, Happiness, and Flower, has been on the move lately, releasing six singles and an album since the end of 2011. Their latest effort, Gommenasai no Kissing You, has peaked at number two on the Oricon charts and become their highest selling single to date, but is it deserving of the hype? Lead track Gomennasai no Kissing You (ごめんなさいのKissing You) is a fabulous blend of R&B production and picopop instrumentation that results in a fun, bubbly dance pop sound. Each layer of synthesizer beeps and boops, twinkles and stabs, and take-off crescendos melts together in a delicious manner to create this track which honestly just makes you want to bounce along. And I’m quite appreciative of the fact that there’s only the briefest of dubstep nods. Chosen vocalists this time around are Flower’s Reina Washio and Dream’s Ami and Shizuka, displaying thankfully unvocoded chops that work well with the production; one could even hope to make a unit of these three (though perhaps that’s what E-girls is already for). I enjoyed the song 60 seconds into my first listen and have had it pretty much on repeat since then. The vibrant, sunny single would’ve been a perfect summer jam to play during car rides or water fights on the beach – it just brings those kind of party with friends feelings to the surface. Hatsukoi (初恋), the ‘solo’ effort from freshman group Flower, is a pretty standard R&B-pop ballad. The girls belt it out over piano melodies and soft clap beats alongside fuzzy bass, drowning in pseudo-classy builds of sweeping synthesized strings. While actually a nice track and made quite well, it seems out of place after the upbeat dance party of a lead track. The girls sound amazing though, proving they’re not just pretty faces and slick dance moves. The song could’ve been a nice lead track for Flower, but on this single it seems somewhat lost. The single’s next b-side is Fancy Baby, which is a song I would more readily identify with the groups that make up E-girls. The dancey pop-R&B track is something I could easily picture being on a Happiness or Dream record. Funky bass and deep synth give the track a floaty, strut. Paired with the girls’ sultry, purring vocals, Fancy Baby’s sound is a female R&B staple without being clichéd or lazy. The last track on the single is Koi no BOOGIE WOOGIE TRAIN (恋のブギ・ウギ・トレイン), a cover the 1979 Ann Lewis classic. 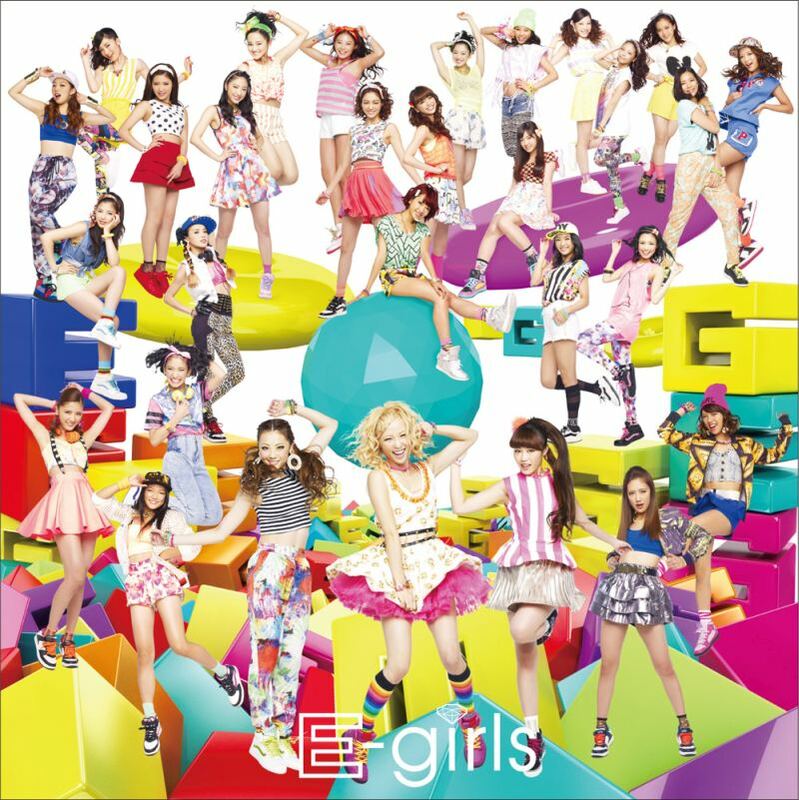 Much like the original, E-girls’ version is a twinkling, funky romp. While an update to the disco favorite, the track doesn’t stray too far from what made it enjoyable almost 35 years ago. The full bodied production, with its somewhat spacey feel, is reminiscent of contemporary Christmas songs; something about the twinkle synths, tubular bells, harp arpeggios and staccato strings just paint a wintery picture for me. But really, the song is all about the bass line. E-girls are starting to hit their stride, gaining more and more popularity with each release. Their third single this year, and fourth release overall for 2013, Gomennasai no Kissing You is proving the group is serious. However, I do hope this doesn’t detract from the individual units getting back to business soon (Dream and Happiness have released very little while E-girls have been active the past 22 months). But until that happens, I will be glad to follow E-girls if they keep putting out solid releases like this fall stunner.